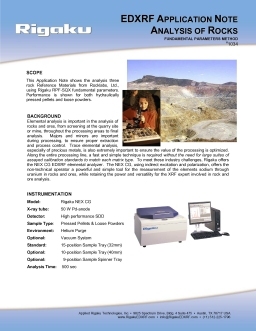 EDXRF | XRF for Geology & Oceanography - Applied Rigaku Technologies, Inc. In studying the planetary processes and makeup of the Earth (geology), geologists routinely analyze the composition of rock and mineral samples. 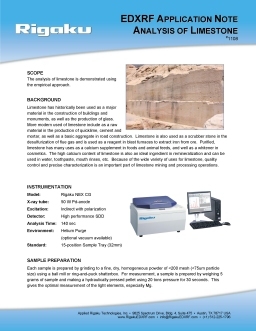 Rapid elemental analyses for sodium (11Na) through uranium (92U) can be accomplished, through the use of cost-effective, high-performance Energy Dispersive X-ray Fluorescence (EDXRF, XRF) instrumentation without destruction, digestion or alteration of the sample. Eliminating the need for a wet chemistry lab has made the EDXRF technique of particular interest to the geological community. The Rigaku NEX CG EDXRF is powered by a new qualitative and quantitative analytical software, RPF-SQX, that features Rigaku Profile Fitting (RPF) technology. The software allows semi-quantitative analysis of almost all sample types without standards - and rigorous quantitative analysis with a few standards. Featuring Rigaku's famous Scatter FP method, the software can automatically estimate the concentration of unobserved low atomic number elements (H to F) and provide appropriate corrections. RPF-SQX greatly reduces the number of required standards, for a given level of calibration fit, as compared to conventional EDXRF analytical software. 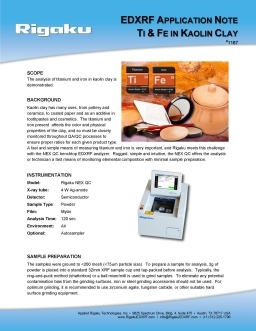 As standards are expensive, and can be difficult to obtain for newly developed materials, the utility of having a Rigaku NEX CG EDXRF spectrometer can significantly lower costs and reduce workload requirements for routine elemental analysis needs. 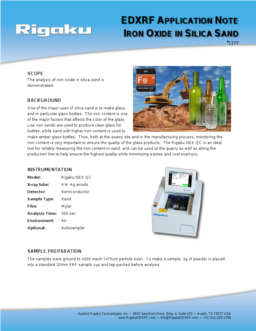 As a premium low cost benchtop Energy Dispersive X-ray Fluorescence (EDXRF) spectrometer, the Rigaku NEX QC delivers wide elemental coverage with an easy-to-learn software interface in a robust package designed for industrial at-line quality control elemental analysis applications. The new Rigaku NEX QC features an intuitive "icon-driven" touch screen interface for easy operation and a built-in printer for convenience. The shuttered 50kV X-ray tube and Peltier cooled semiconductor detector deliver exceptional short-term repeatability and long-term reproducibility with excellent element peak resolution. This high voltage capability (50 kV), along with multiple automated X-ray tube filters, provides a wide range of applications versatility and low limits-of-detection (LOD). Options include fundamental parameters, automatic sample changer, sample spinner and helium purge for enhanced light element sensitivity. The Geological Society - London, U.K.